One Direction are almost always on tour, which means there are lots of chances to see the boys do their thing in a stadium setting — even if they are minus Zayn this year. If you plan to go to a One Direction concert this summer, well, there are plenty of stylish concert outfits to wear besides a homemade t-shirt celebrating your love for a particular member of the now-foursome. Leave the super creative and insanely adorable puffy paint-designed "Mrs. Harry Styles" tees to the younger set and show up to have a good time as fashionably as possible. And let's be clear about a very critical point. There is absolutely no 1D shaming here. If you love the boys, go see them and do so as fabulously. I saw them a few years back and it was the loudest concert I have ever been to. I can't wait to see them again, and I fall far outside of their traditional demo, which really means that the limit of who can and can't be a 1D fan doesn't really exist. I've created five outfits to take inspiration from — one for each member, since I'm still holding out for Zayn Malik's return. This LBD is simple and comfy for a long, loud, and hot night, but you can take it to the next level with accessories, like two sets of red lips, print bed flip flops, and even a 1D pendant to show your love in a cute and subtle way. It's a somewhat classic ensemble with a few modern touches, just like Liam. This denim-driven outfit is just right for the 1D fan that thinks LT is the cutest. He wears a lot of denim, but also cleans up nice. So short shorts, a funny Hazza-themed tee, since the boys always riff on each other, and a fringed backpack, along with gold hoops, stacked rings, and Chucks allow for a girly glam look. Don't skip the Louis cell phone case, either. That's the most essential accessory of all. Zayn may be gone, even removing all 1D references from his Twitter feed, making his exit "Twitter official." Ouchies. But he will live in our hearts forever. Zayniacs can show off their edgier side with destroyed 'n' cuffed boyfriend jeans, an off-the-shoulder sweatshirt referencing former 1D tourmates, stacks of bangles, layers of necklaces, and huaraches. Niall is a classic hottie, with his white blonde locks and baby blues. These overalls get a kick from a red bandeau, red Converse, and a Yankee cap, so you can show off your own homeland pride. Bonus: It's also an all-purpose summer outfit you can wear for other occasions, like trips to the amusement park, fairs, and more. 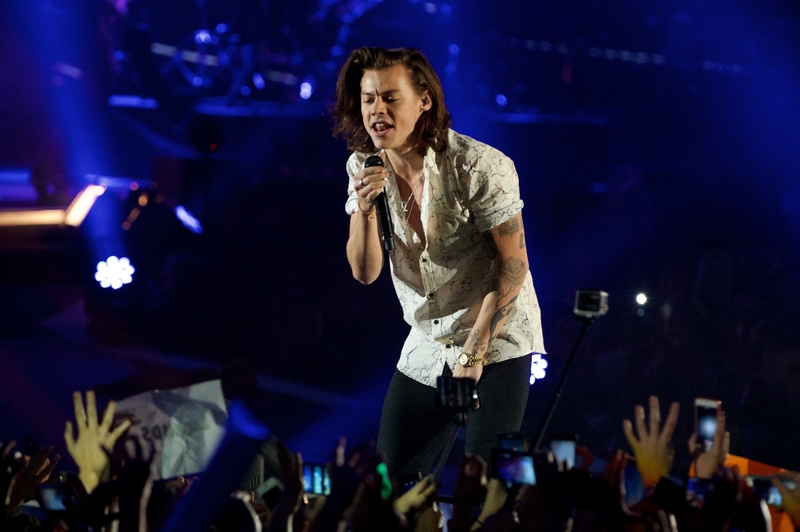 If you totally worship at the altar of Harry Styles — because who doesn't? — you may want to channel some of his ultra-glam exes, Taylor Swift and Kendall Jenner. This outfit, comprised of a pleated leather skirt, a kicked up graphic tee, a crossbody, and fringed gladiator sandals, along with a cuff and a slick pink gloss, is feminine without being too young. It's tasteful and Harry date-ready. So there you have it, Directioners. Everybody's gonna wanna to steal your outfit, girl.